She is a 9-week-old German Shepherd that I got as a reward for myself for losing 100 pounds. She's going to be my activity partner, and she also is very, *very* good at distracting me from bingeing or overeating. 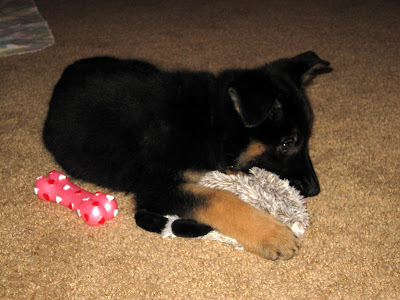 In fact, since I got her I have barely had time to *think* about food, much less obsess over it. I am back down to 178 pounds as of this morning. I had been trying for years to find something... anything... that would get my head of of the food-obsessive mode. Diet is important (staying off sugar and refined carbs) but the mental part... the letting my brain turn to food, food, food all the time... that also involves putting thoughts of *something else* in its place. And there is nothing like a new puppy to get your mind off food and keep you so occupied and "outside of your own head" and into *life* that food obsession takes a backseat. Trust me on that one. My heart goes pitter patter! Is she a bi-color? I'm not good at figuring out the colors....I just know my GSD is white ;) Congrats! She is BEYOND PRECIOUS!! Congrats and here's to happy puppy times! Cherish every moment!!! I LOVE a new puppy! I hope you enjoy her!! do you have snow where you are? I remember with my puppy taking her out in the middle of the night in the snow..lol..don't miss those days, but oh they were worth it. omg how cute! and what fun to have a workout pal!! I love your pics by the way. Great job and very inspiring!! Awww... She is just the cutest personal trainer I have ever seen. I just got a puppy today too. A lab mix named Max who was a shelter rescue. Aww. She is cute. I am happy for you. I was hoping your exciting news was a puppy! Congratulations! She's beautiful! She is so cute, I just want to hug her! I am hoping it will warm up now, so I can take my dog for a walk again! I just can't do it when it is so far below freezing every day! Enjoy her! Oh my God, I am so happy for you and your family! What a wonderful addition to your home! Yes, please, more pics!! She is absolutely adorable. What a wonderful reward for you. Can't wait to hear your further adventures with her? Is she going to have her own Doggie blog? oh my goodness, she reminds me of my "misty" we had for 14 wonderful years...looks just like her. I'm so glad for you! German Shepherds are the best! What a lucky little pup to have you as her mommy :) Congrats! Awesome! :D That pup is going to get big FAST!! Hope you leash train early and often. :) Congrats! So cute! Congratulations on the new distraction :D. Dogs are awesome. I had a Shepherd for a number of years, who was super smart and a joy to have around! We don't have children, so our fur-child, Rascal, is King of the House! Oh, she's beautiful. Congratulations and I think she's a much better way to reward yourself for meeting this milestone than a cookie or a night out at a fancy restaurant! She is cute for sure! Plus will be a gret running partner when she gets a bit bigger and trained. Ooooohhh! I thought you were up to something these last couple of days. She is too cute. Keep the photos coming! Well done on the 100lb lost also. Aww! What a cute pup! May she be just the personal trainer you're looking for! Puppy!!!! She's adorable. That's great that you found such a fun distraction! What a cutie. I just want to scoop her up!! I PUFFY HEART GERMAN SHEPHERDS! She's adorable. They are fantastic dogs - you definitely will chase off some calories keeping up with her! Congratulations! Congrats on hitting 178 again! Enjoy that puppy! I have Australian Shepherds and train herding dogs here on my farm, so I have a soft spot for GSD's! Very fun and smart dogs. Post pictures as much as you want - puppy pictures are the best! Absolutely adorable, congratulations & enjoy your reward! She is ah-dorable! And, oh-so-lucky to have found you! I couldn't do a dog, (there is only room in my house for one high-maintenance b*tch and it's me!) but Bravo, you for taking on this responsbility! We enjoy our cat, and you're right, the companionship of a pet is often just the distraction and/or motivator we need to keep us focused on our (weight loss) goals! Too cute! If your German Shep. pup is anything like mine, you're going to have your hands full! I wouldn't trade my Della for anything though. Good luck with yours! Wow, she's adorable!!! New puppies are such a blessing, some of my happiest/busiest times have been looking after them. Congratulations, and I love the name! Love that dog, love your blog!! Keeping me inspired! She's absolutely adorables :) Maybe a puppy of the day picture?? She's a sweetie..I've noticed these past 3 weeks during which I've been unable to spend much time on my hobby I've thought more about food and hence had more of an appetite. When I stay busy doing something I enjoy--that is not food related--I don't even think about food...in fact I can easily forget to eat. But if I read too many food blogs or watch cooking programs I am hungry all the time. Lyn, I am completely in love with her from afar. What a sweet face! How cute, and congratulations on your weight! What a CUTIE - have a wonderful time with your new trainer! :) And she's lucky to have YOU. Best thing I ever did was get my girl, she's a Kelpie/Shepherd cross. She will protect me to the death as well, which is a bonus. And she has that exact same pink squeaky bone!! I just started reading your blog, and I am definitely enjoying reading it! Bring on those adorable puppy pictures! She is a cutie---congratulations!!!! OMG - she is gorgeous! When we got our 3rd(!) Shar Pei, and I was running absolutely ragged because he was so energetic, and our #2 Pei is aggressive so I was trying to get them to get along, I always joked that I was on the "3 Dog Diet!" Because walking 3 dogs separately, intercepting potential fights, all the while keeping them all appropriately groomed, fed, trained, and loved, was absolutely exhausting! But I loved it! Good luck! What a fantastic reward for yourself. I hope she keeps you motivated to at least go for a walk every day. Congrats on a new friend! She is darling! Congratulations on 100 pounds!